In the end, I was debugging my mocha tests using WebStorm and node-inspector inside the containers and got stuff running. 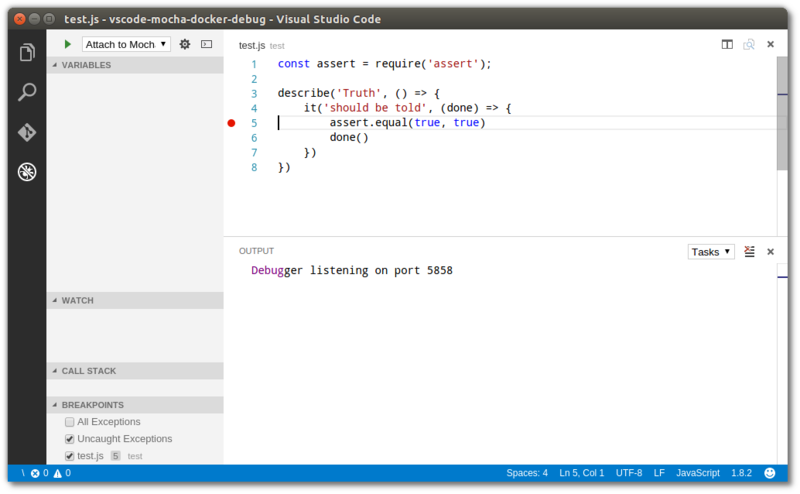 As I have been playing around with Visual Studio Code recently and debugging Node.js in Docker containers as well as debugging mocha tests (both using VS Code), this thought came up: "how would I be able to debug mocha tests using Visual Studio Code in Docker containers?" In the end, it worked out to be pretty staight forwarded. This application isn't really required for our tests but my aforementioned scenario was like it. Furthermore we need a process that prevents our container from exiting after he has been started, so we'll stick with that little app. As I don't want to have a container dedicated for debugging of mocha tests, I prefer the first version. Starting the container consists of building the image and running the container. This can be easily automated using nodemon, grunt-watch or something similar. You could even use a Docker Volume and not restart the container at all. $ docker build -t vscodemocha . 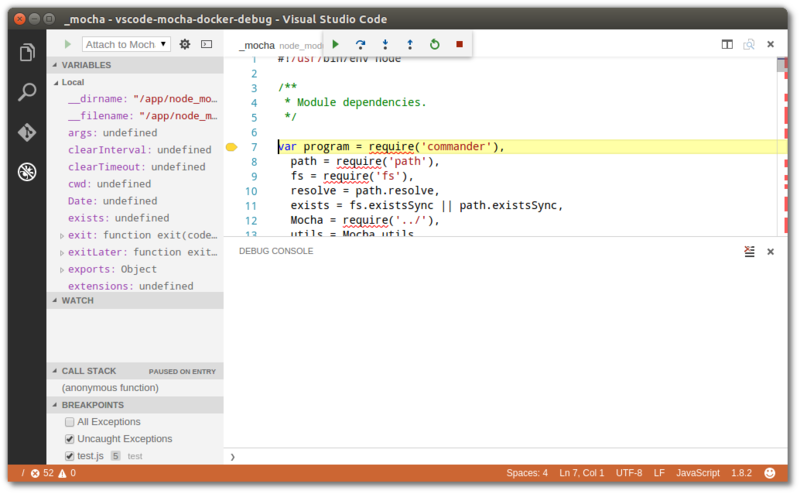 With our container being up and running, we can configure Visual Studio Code to run mocha inside the container. The Visual Studio Code attach Configuration allows to provide a preLaunchTask which is a task that can be defined inside the tasks configuration in tasks.json. "docker exec -i vscodemocha bash -c \"./node_modules/mocha/bin/mocha --debug-brk=5858 -t 10000 test/test.js\""
As already said, runmochaindocker now is defined as a preLaunchTask. And as already described in my recent post on debugging a Node.js app in a Docker container, I set localRoot and remoteRoot accordingly. (To be honest, I'm not sure why the debugger breaks here - but we can ignore that).